Today, India announced its Intended Nationally Determined Contribution (INDC) - a long-term commitment to curb its greenhouse gas (GHG) emissions under the United Nations Framework Convention on Climate Change (UNFCCC). My colleague Anjali Jaiswal provides an excellent overview of India's INDC here. It is important to contextualize the enormity of India's task given that about 350 million people in India do not have access to electricity and about an equal number subsist on less than $40 per month. Clearly, India's priority is to significantly reduce financial and energy poverty, while causing the least possible harm to the environment. Here's a closer look at two of India's key INDC targets that aim to walk the tightrope between development and sustainability. Emissions intensity refers to amount of GHG emissions required to produce a unit of economic output. The 30-35% intensity reduction target, which is in line with India's Copenhagen pledge of 20-25% reduction by 2020, means while India's GDP is projected to increase by 5 to 7 times, absolute carbon emissions will increase by only 3 times by 2030 over 2005 levels. 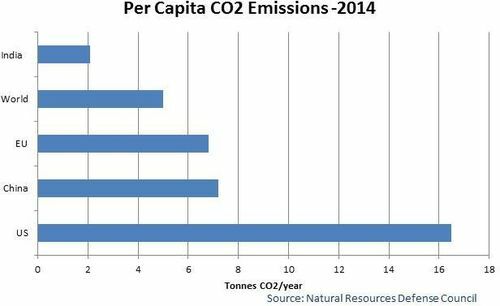 Another way to look at this target is in terms of per capita emissions. By 2030, India will be the most populous country in the world. Between 2005 and 2030 India would have added the entire current population of European Union, and will have about 1.5 billion inhabitants. Given the climate commitments of other major economies, India in 2030 is projected to contribute about a tenth of global carbon emissions while being home to approximately a fifth of the global population. Despite being a large absolute emitter of CO2, India is one of the most frugal countries in the world on per capita carbon emission and with the intensity reduction targets, will continue to be so. Renewable energy serves as the cornerstone for India's emissions reduction strategy. The INDC calls for increasing the share of non-fossil fuel energy in the total installed capacity to 40% by 2030. Currently, this share is about 30%. 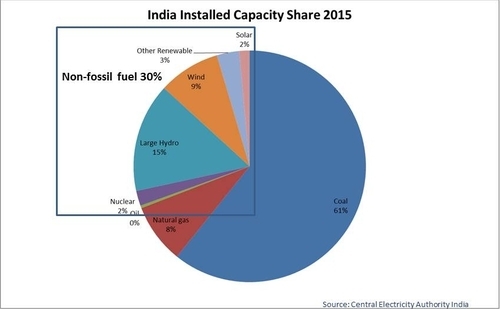 Given that India has a huge pipeline of thermal power capacity addition, non-coal based power has to grow faster than coal-based power in order to achieve an increased share of the pie. However, the INDC clubs large hydro and nuclear as a part of non-fossil fuel energy sources. It is important that most of the increased share comes from safe and ecologically sustainable renewable energy sources such as solar, wind, small hydro and waste to energy technologies. Earlier this year, India expanded its National Solar Mission (NSM) to aim for a target of 100 GW in installed solar energy capacity by 2022, which is five times its previous target of 20 GW. Additionally, India is planning to reach a total of 60 GW of wind energy capacity by 2022. India's planned wind and solar capacity far exceeds what the International Energy Agency (IEA) projected it should achieve by 2020 and 2030 to contribute towards the goal of keeping temperatures below 2 degrees Celsius. Comparisons of India's climate commitments will inevitably be made with commitments from other major economies. NRDC has been tracking all INDCs as they have come in, and a summary is available here. India has made a firm commitment to fight climate change despite the huge developmental challenges it faces. October 2nd is the birth date of Mahatma Gandhi. Most people who grew up in India reading NCERT textbooks, would recall Gandhiji's Talisman on the first page: 'Before you do anything, stop and recall the face of the poorest, most helpless, destitute person you have seen and ask yourself, is what I am about to do going to help him?' India is home to the perhaps the largest number of people vulnerable to the hazardous impacts of climate change. To safeguard their lives and wellbeing, and to truly honor the words of the Mahatma, India should endeavor to deliver well beyond these targets. 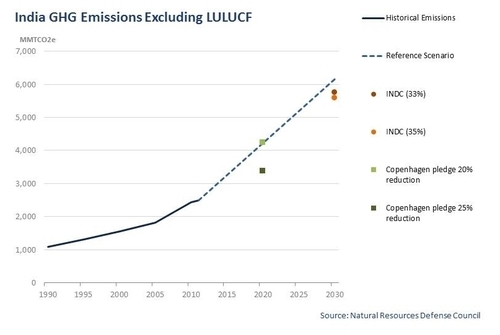 * The emissions chart in this graph has been updated to include a Reference Scenario, based upon the Government of India Planning Commissions CO2 projections for a Baseline, Inclusive Growth scenario, and the non-CO2 projections from the US Environmental Protection Agency. Emissions totals for the INDC pledge were calculated using World Bank 2005 GDP and OECD GDP growth projections of 5.8 percent.